After all the success with our first WEEN poster and the subsequent success of the WEEN t-shirt design, we were approached to produce another great concert poster for the group. This awesome 3-color design is screened on trimmed down black French Paper cover stock. Designed by T-Bone & Aljax and printed & produced by ABNRML, this print will be available on April 7th in Winston Salem, NC at the show AND after the show through us. I limited number of 80 prints were produced and are sure to be a collectors item! We looking forward to our future collaborations with Ween! Behold the brand spanking new poster for Hot Chip's show at the TLA in Phildelphia, PA in late April. This is a very special poster for Abnormal. We have loved and listened to Hot Chip since their 'Coming On Strong' days, seen them several times live and love their 2010 release 'One Life Stand'. We are proud to team up with ABNRML cohorts T-Bone and Aljax to produce this amazing 4-color silk screened poster. The design was screened on 19"X26" pink French Paper cover stock. Only a limited number we printed half go to Live Nation and Hot Chip so if you want one drop us a line! 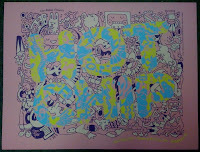 The poster will be available the night of the show. (4.25.10) Hopefully this is the first in a long line of Live Nation approved prints! Check out Zomic's latest screen print! This is a 2-color poster for The Dillinger Escape Plan's performance at the First Unitarian Church in Philadelphia, PA on March 28th 2010. 50 of these 12.5"X19" posters were screened on green French Paper cover stock and will be available the night of the show. J Dub All Stars artist and John Warner protege Mike Giorgi enters the poster scene with a great first print. 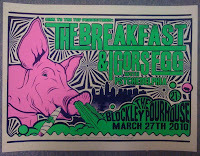 This 3-color poster was designed by Mike for The Breakfast and Igors Egg (w/ Pyschedelphia) for their March 27th show at The Blockley Poorhouse. It was screened on 19"X26" Oatmeal French Paper cover stock. This was Mike's first screen print and we think it turned out great. A very limited number were screened and will be available at the show. We look forward to printing more of Mike's work soon! Zomic's Charles Moran rings in the year with his first ABNRML screen print of 2010. His simplistic yet tasteful 2-color design for Justin Townes Earle was screened on 12.5"X19" brown French Paper cover stock. The brown is rich with gold metallic flakes which really jump out when you are looking at the poster in person. Justin Earle, Zomic and the print will be at Johnny Brenda's in Phildelphia, PA on March 6th! Pick one of these babies up!